‘Jazz-folk diva’ Gwyneth Herbert was entertaining in the second part… but then I’m not generally one for singers, really, so it’s probably unfair for me to comment… I see that songs can quickly generate a wide range of moods, each lurching to some new angle or emotion, and this set was certainly more varied than Mseleku’s. Herbert is a fine vocalist, I think, but, with all this ‘diva’ business it all gets a bit ‘show-business’… It was also frustratingly undemocratic; with Herbert being the single focus, the band never really got much of a chance to stretch out. 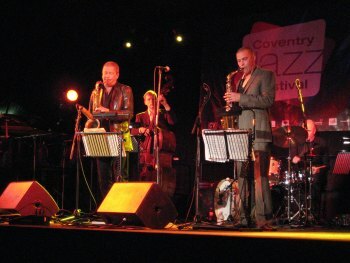 I had seen this ‘act’ last year at the London Jazz Festival, and this Coventry performance was essentially an exact repeat of everything they had done then… It’s basically the stage-version of Wilson’s most recent CD, Ride! Ferris Wheel to the Modern Day Delta (although, disclaimer: I’ve never actually listened to the CD itself). Supposedly it tells the story of some kid wandering across the United States doing something or other with some people, and something else with someone who may or may not be his uncle, and who may or may not run a Jazz club somewhere in the Southern states… The tunes are interspersed with spoken word from Wilson, apparently carrying the story along, but they don’t really make sense by themselves; they sound like fragments of something that may be expanded upon in the record (? ), but as fragments they don’t really make sense, and I found it hard (on both occasions) to really follow what was going on. The band itself is fantastic; most of them Dune records stalwarts, Tomorrows Warriors alumni, etc. Wilson is, himself, a New Orleans ex pat, this record clearly dedicated to that origin of music. The band is tight, but fluid and easy, with strong blues and roots… I really liked the stuff coming from Denys Baptiste, some rip-roaring solos… Abram Wilson himself played pert trumpet lines… The drummer was really expressive… Although I had seen them before, there was more fire overall, this time around… A solid act, fabulously entertaining, and solid swinging jazz (traditional sounding arrangements, but present and fresh). Maybe would be better if they could sort out the weird nonsensical vocal bits (make the narrative a bit more obvious) and loosen up the rigorous ‘act’ a bit (hearing the same ‘off the cuff’ banter on both occasions gets a bit annoying). Technically the jazz festival wouldn’t be over until the end of Monday’s Blues in the Ruins but, out of habit, I always miss that bit out… Andy Sheppard brought a fine close to my festival, however, bringing his group the Luna-Tics. Although, I’m not exactly sure what that means, since the rhythm section appeared to have been bussed in, new to Sheppard and James Morton. It seemed to be something of a Sheppard-as-mentor (to Morton) project (if that’s not out of order); Sheppard seemed to be in tight control of the group, but there was a lot of delegation, leaving the majority of solo time to Morton. 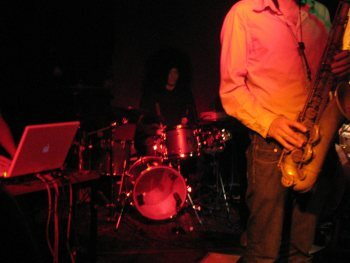 The group underlined by a powerful drum n bass drum and bass, twin bright saxes making it sound positively futuristic. Sheppard I find intriguing because his fluid, mellow soprano sax lines always seem to verge onto the edge of meandering Smooth, but his great improvisational skill just succeeds in pulling it back from the edge… He played tenor, too, on which he has a slightly more gruff and edgy style. 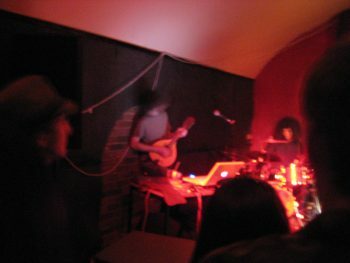 The (young-ish) Morton played riffing post-boppish stuff, mixing in positively with the drum&bass. Specifically, they played a few solid 60’s standards, and then finished with a free-er revolving piece Sheppard called the ‘Hotel Suite’ (first piece: ‘Meet me in the Lobby’), which was apparently a work in progress, and based upon his touring experiences… Essentially this was the most straight-up, ‘safe’ band of the festival headliners, but Sheppard ensured it located itself somewhere much more forward looking than perhaps most other contemporary British post/neo-bop. Quite a few large groups at this year’s festival: Abram Wilson’s large Ride! Ferris Wheel… group on Sunday evening, and two ‘proper’ big bands: the Mingus Big Band (performing here at the mid-point of their UK tour) on the Friday, and Stan Tracey’s (more traditional) big band filling the ruins’ marquee on the Saturday night. 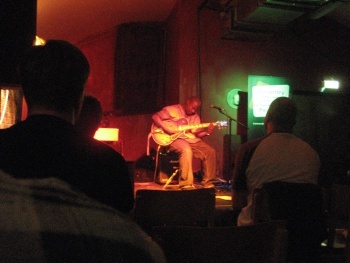 With Mingus still ringing in my ears, I ran off to catch the end of Cameron Pierre‘s gig at the canal basin’s Taylor John’s House. It was a pretty interesting contrast to the Mingus group because, although the trio was essentially pretty straight up and down not-quite-standards, I found it all a lot more infectously engaging. Pierre was all great winding, heavily vocal, articulate lines. Anders Olinder played great tight, effortlessly matter-of-fact organ lines, and Rod Youngs brought it all together with sensitive drums… Doesn’t have to be complicated! I had previously seen Stan Tracey in trio format (with Cleyndert and Clark Tracey) ‘supporting’ Wayne Shorter at the Barbican, last year, but wasn’t really overwhelmed. 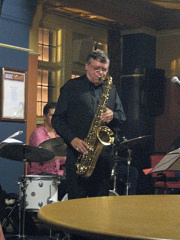 This big band—retaining that same trio as a rhythmic core—was much more invigorating. A hot selection of pieces, some Ellington stuff, Epistrophy and other Monk workings, but covering a range of moods, from hot swing to thoughtful ballads. Nice soloing from Alan Barnes and Mornington Lockett, Guy Barker too, off-hand fluid movements, but lines that strode through the beefy arrangements; clear and definite. Andrew Cleyndert’s bass was particularly fulsome. Even though this is a band working within fairly well-defined territory, and even with the standard big band cliches all present and correct, pasted in to all the right places, it came over much more successfully than the Mingus band… Even if only in terms of clarity. Though I actually first formed interest in jazz music through listening to my grandparents’ big band recordings, once John Coltrane had been discovered, I pushed ‘big band’ away, tired of the cliches and too-slick arrangements. But hearing this powerful band live I think I might have to reappraise that prejudice. Although, I think live is the key, and I’m not sure it could necessarily preserve the fire on tape. Seeing this has also taught me to reappraise my prejudice against the Godfather himself. At the Barbican, the trio sounded stodgy, clumpy and as cold as granite. On record: Under Milk Wood is good for Starless and Bible Black, but the rest of it seemed too cold and lifeless, melody by numbers and rock hard. 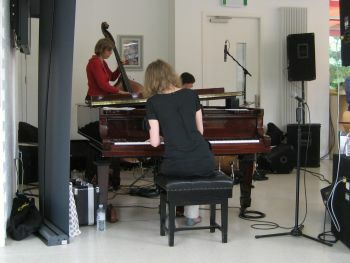 But in the context of this (much) larger group, I really liked Tracey’s piano playing; it’s sort of minimalist in a partly Duke Ellington sort of way, almost monophonic, but here it underlined and texturalised the band in a sound that was very profound. A fair smattering of free gigs across the weekend… Putting them on at lunch time, in places serving plenty of food, made them, on paper, look like warm-ups; but that’s disingenuous… Good music! 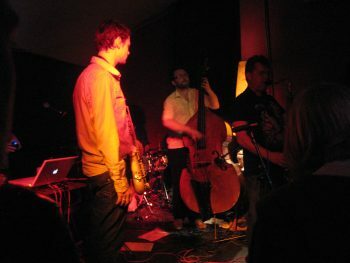 Really excellent gig tonight by Alan Skidmore and, what is apparently, his current working quartet. Although Skidmore is well-known as a strong follower of everything Coltrane, tonights gig was particularly heavy (actually, full) of Trane compositions (and arrangements) in a gesture to celebrate what would have been JC’s 80th birthday, last Saturday. 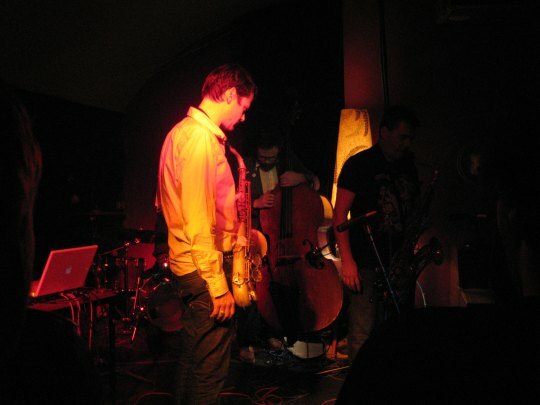 This is the second time I’ve been able to see Skidmore (the first time was also in Coventry), but he’d managed to bring a much better band with him, this time. Actually, a really phenomenal band… Skidmore was on fire throughout… The pianist was able to pull the lever and drop into McCoy Tyner mode as and when required… However, I was totally blown away by Ian Palmer, who is just a truly magnificent drummer. ‘Pulled out a staggering drum solo somewhere towards the end of the first set (a proper extended solo, with the band letting him carry on until he was begging them to come back)… It was probably the best single drum solo that I’ve ever witnessed, just in terms of shear power, fluidity, and also originality and a fantastic sense of lyricism… Rather than just kicking up some great rhythms, everything seemed to be going somewhere with definite purpose. I mean, it’s usual for me to come away from most gigs and decide that that respective drummer is now my best drummer in the world, but this guy Palmer was really something of a surprise!